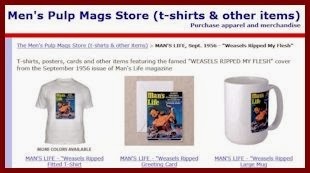 As noted in my previous post, Frank Zappa took the title of his 1970 album Weasels Ripped My Flesh from a cover headline on the September 1956 issue of Man's Life, one of the classic men's adventure magazines. 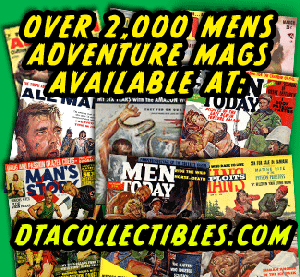 Animal attack headlines and stories were a signature theme of men's pulp mags of the '50s and '60s. It didn't really matter if the animals involved really were dangerous. Of course, some were – like lions, bears, crocs, snakes, and so on. But many of the critters that were used for killer creature headlines and stories aren’t really very dangerous, if at all – such as crabs, birds, rodents, iguanas, anteaters and even otters (see the I BATTLED A GIANT OTTER cover at left). 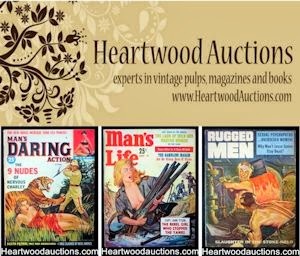 Of course, petty reality factors didn't matter to most sweat mag editors, as long as the headlines and cover art enticed readers to buy the magazines. Sometimes, the stories weren't written until after an editor came up with a great man vs. nature headline or idea; sometimes the stories weren't written until after an artist had also created an eyeball-grabbing painting to go with the concept. Often, the cover art and headlines were a lot more entertaining than the stories that went with them. 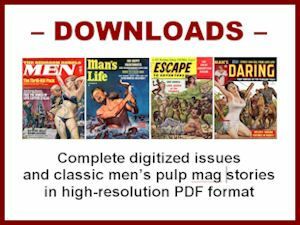 This cover features a superb man vs. bats painting by the legendary pulp artist Norman Saunders. 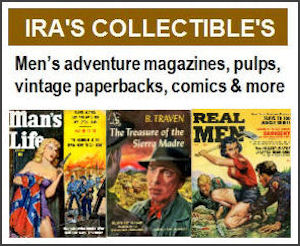 He created many great illustrations for men's sweat mags, as well as for pulp fiction paperbacks, comics and other publications. Saunders' most famous works were his illustrations for the still popular Mars Attacks trading cards of the 1960s. BOOK NOTE: There’s a comprehensive, beautifully illustrated book about Norman’s career, authored by his son David Saunders.